A rugged island 300-yards off the Donegal coast is the setting for Paul Charles’ new Inspector Starrett murder mystery. 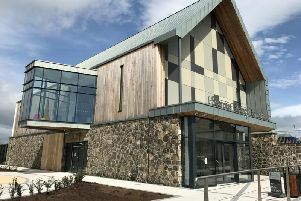 St Ernan’s Blues revolves around ‘a retirement home’ for priests which is thrown into upheaval after the body of one them - Fr Matthew McKaye - is found in the kitchen. The mild mannered Inspector Starrett is brought in to investigate the suspicious death and begins to delve into the lives of the clergy with the aim of finding the killer. Talking about the book, Charles says he wanted to create an “Agatha Christie vibe” in having a lot of characters in one place at the time of the crime. He has a house in Donegal and he and his wife, Cathy, visit the county each summer. “The island with the house seemed an ideal location,” said the former Magherafelt man, who combines his writing with his work as a music agent for acts such as The Kinks, Christie Moore and The Waterboys. Just back from a 12-city tour of the USA to promote his book, he is due to launch St Ernan’s Blues at No Alibis Bookstore in Belfast later today (Thursday). “I like book events because they give me a chance to meet and chat with my readers,” he said. He’s already started work on the first draft of a new novel. He writes without a plan and the work is completed within a 15-month cycle. But he admits to “doing a lot of research” He never runs out of ideas for story plots and jots down lines and character descriptions for use in future novels. Charles love for the genre led to him writing the popular Inspector Christy Kennedy mysteries - 10 and counting - set in Primrose Hill and Camden Town. His books are selling well in the USA and Europe.